Young expecting parents may have strange ways of coping with the inevitable. Some research and read every book they can get their hands on or watch every video they can find on the Internet, and some just let it happen, taking advice from those who have gone through the same experience. 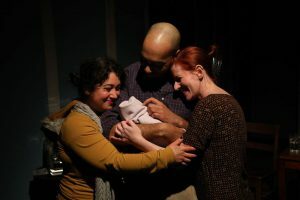 Everyone has their own way of coping and preparing and in The Strand Theatre’s latest offering, And Baby Makes Seven by Paula Vogel, Directed by Emily Hall, gives us a glance into what could be called an unconventional coping and preparation mechanism from an expecting mother, her lesbian partner, and male friend/father. The trio works their way through the usual issues of expecting parents with humor and poignancy, which, in the end, is pretty much like everyone else. In a few words, And Baby Makes Seven concerns itself with a trio of folks expecting a baby, but realize they have to get rid of the three imaginary children in the house before the real baby comes. Sound a little off? Well, it is, but it all comes out in the wash.
Set Design by Kate Smith-Morse works just about perfectly for this piece. It’s an intimate space, but Smith-Morse has used her workspace wisely. There is a simple separation between the two main spaces, a bedroom and the kitchen area, but it’s just enough to be distinguishable. It is a realistic set that fits nicely with this production. Smith-Morse’s design doesn’t hinder any action and helps the action flow smoothly making for a well thought-out design. Emily Hall takes the helm of this production and her Direction of this piece is superb. As I mentioned, this theatre is an intimate space and a show like this, with only three characters, is perfect for this stage. Hall seems to have a good comprehension of the characters and she has guided this apt cast into telling this story well. For such a quirky tale, Hall has presented it in an easy to follow fashion and her vision is clear… it’s a group of folks simply trying to cope with a pending birth, and doing what they feel is right, regardless of what anyone else may think about it. Hall is to be commended for her work on this production. Moving to the performance aspect of this piece, this trio of actors work their way through this script superbly. Though Jess Rivera, as Ruth, the non-pregnant female in this trio, started off by annoying me with her over the top portrayal of imaginary Henri, a young French boy, and imaginary Orphan, a dog of sorts, but I found myself getting used to it as the play progressed. Rivera certainly knows what she’s doing on stage, but it looked as though she was trying to hard as the imaginary kids. However, when she switched off to play the normal, everyday Ruth, she shined and portrayed her effortlessly, so, I can see this actress has an real talent. Overall, Rivera has a tight grasp on this character and gives a great showing and makes these characters endearing, making for a delightful performance. Next up, Katherine Vary takes on the role of Anna, and the imaginary child genius, Cecil. Vary is well in tune with this character and her character’s imaginary counterpart. She plays Anna, the pregnant character, with ease. She seems to have a good understanding of this character, as well as with Cecil, making him just irritating enough, but charming a the same time, which is not small feat. Her delivery is smooth and natural and, overall, she gives a strong, confident performance. Rounding out this stellar ensemble is Grand Emerson Harvey, who takes on the role of Peter, the father of the unborn child, and thought it’s eluded to him being a homosexual, it’s only really hinted at in a few lines toward the beginning of the play. Either way, Harvey pulled this role off beautifully and confidently. This character seems to be the only “normal” one in this trio, keeping his feet grounded in the real world, but he also understands that Ruth and Anna need to have these imaginary kids to cope and prepare themselves for what’s to come, and… maybe he does, too. Harvey was near flawless in his portrayal of this character. He made this character his own and seemed to embody him. His delivery is clear and concise and he really brings the character to life. Working in tandem with Rivera and Vary, this trio seems to naturally fit with brilliant chemistry and it just makes the characters more real and the story more believable. 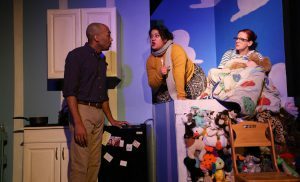 Final thought… And Baby Makes Seven at The Strand Theatre is a quirky, comedic take of how people prepare themselves and cope with pregnancy and the inevitable addition of a new baby to the family. However, don’t let the imaginary children fool you. In the end, I really liked these characters because they knew the kids were imaginary and knew they were pretending and nothing more, adding a realism that was needed. 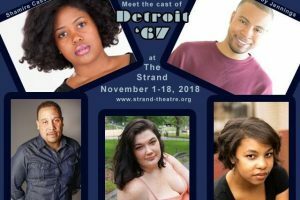 Paula Vogel has weaved a poignant, off-center story about a blended family and their interpretation of the world around them. It may take a moment to get into the groove with this piece, but the small three-person ensemble presents these characters beautifully and truthfully, making for a delightful evening of theatre. You may have to pay extra attention to to keep up with the characters, but the ensemble does a good job keeping everything in place. If you haven’t seen it yet, it’s definitely worth checking out. 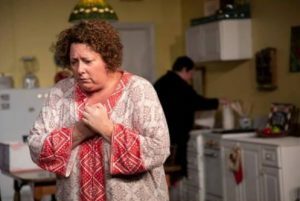 This is what I thought of The Strand Theatre’s production of And Baby Makes Seven… What did you think? Please feel free to leave a comment! 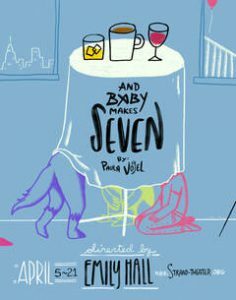 And Baby Makes Seven will play through April 21 at The Strand Theatre, 5426 Harford Road, Baltimore, MD. For tickets, call the box office at 443-874-4917 or you can purchase them online. The American Dream. I often wonder what people from other, less fortunate countries see and hear about America. Are they really told and believe the streets are paved in gold? Are they told you can be anything you want to be? Do they understand we have the right to pursue happiness but not outright happiness itself? 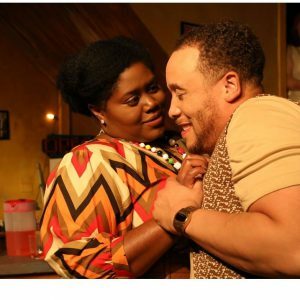 The Strand Theatre‘s latest offering, Sojourners by Mfoniso Udofia and Directed by Cheryl J. Williams, touches on one young Nigerian family’s pursuit of happiness but also includes the obstacles and downfalls that come along with that pursuit. I sheepishly admit that I can’t tell you exactly what this piece is trying to accomplish. From what I gather, and with a little bit of research, Sojourners is the origin story in Udofia’s Ufot Family Cycle of plays. This story concerns itself with Abasiama (Ama) and Ukpong Ekpeyong, a young Nigerian couple expecting their first child and the father has gotten a little too comfortable in America, forgetting his purpose for being here, which is to acquire an education and degree then head back to the homeland. Conversely, Ama has her eye on the prize and is working hard to accomplish it while being very pregnant and working all at the same time. While Ukpong is selfishly having the time of his life, Ama is trying to obtain her goals and meets Moxie, a down-her-luck, streetwise young woman and Disciple Ufot, an astute student from the same area of her hometown. Ama’s new friends care deeply for her and she eventually opens up to both of them, while realizing it’s up to her to be the change she wants to see. Set Design is always tricky in this space, but The Strand Theatre and their production teams always seem to pull it off nicely. This is no different in this production as Set Design by Gabriella Castillo manages to turn the space into many different locations with the use of a couple of simple set pieces and levels. The simple design is practical but presents the locations of each scene nicely and easily. 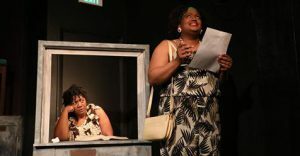 Director Cheryl J. Williams has a deep comprehension of this material and her staging in the intimate, unique space is superb. She has a good grasp on these characters and their conflicts and her casting is spot on. Aside from a couple of clunky scene changes, the action moves smoothly and the presentation is polished. As for time period, the setting is a bit unknown and there’s not a lot of help from costumes by Costume Designer Sharlene Clinton. The wardrobe is a mix of traditional designs with fashions that one would see on the street today. I believe it may be the late 60s or 70s, but don’t quote me on that. Don’t get me wrong, the Costume Design is good but doesn’t make one take much notice, which some could argue is just what a Costume Design is supposed to do. Ama Brown takes on the role of the strong Abasima (Ama) Ekpeyong and she very much carries this entire piece. She is a standout with her exquisite, natural delivery and dialect work. She completely embodies this character and emotes all the feels within this woman and the one to watch in this piece. She seems to have a deep understanding of Ama (the character) and gives a strong, confident performance. In tandem with Brown’s Abasiama, her real life husband, Kenyon Parson takes on the role of Abasiama’s husband, Ukpong Ekpyeong and he, too, is a highlight in this production. Parson portrays a character we are supposed to hate, but his portrayal is so authentic and natural, he comes off as the friend you call to have a good time. In context, this character is having a good time when he’s not supposed to and seems quite selfish, but the dialogue and Parson’s presentation makes him a charming, if not loveable character who we seem to be able to forgive easily, against our better judgement. Rounding out this small ensemble is Jenelle Brown who takes on the role of the savvy Moxie and Grant Emerson Harvey, who excellently portrays Disciple Ufot. Jenelle Brown does well with her character, but seems a little scripted at times and it throws off the flow, just a tad. She seems to get her character but her performance seems forced. Harvey, on the other hand gives a spot on performance and is believable and precise in character. He, too, completely embodies his character and has a tight comprehension of what his character is all about. His portrayal of a young man who is deeply grounded in his traditions but is able to look forward to the future is magnificent and he is confident in his movement and delivery. Overall, he gives an assured and praiseworthy performance. 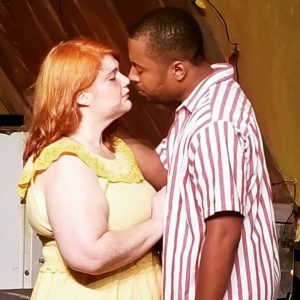 Final thought… Sojourners at The Strand Theatre is a thoughtful and interesting tale of the human experience and keeps the audience entertained, even if it’s hard to pin-point exactly what the piece is about. The strong performances and relatable characters are what make this production extremely successful. There aren’t a lot of bells and whistles with the set and other technical aspects, but the minimal approach works nicely with this piece. I may not get it completely but I can’t deny it’s damn entertaining. 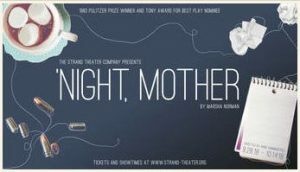 It’s definitely worth checking out and is a great addition to The Strand Theatre’s season. This is what I thought of The Strand Theatre’s production of Sojourners… What did you think? Please feel free to leave a comment! 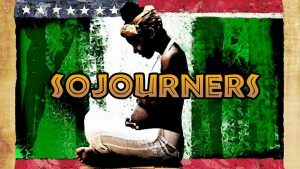 Sojourners will play through March 10 at The Strand Theatre, 5426 Harford Road, Baltimore, MD. For tickets, call the box office at 443-874-4917 or you can purchase them online.